The other day I was reading a magazine and saw an article on defying age. Since I just celebrated the 12th anniversary of my 29th birthday, my eye was drawn right to that info. Most of the tips were things that I knew already. Smile, exercise, stay out of the sun, sunscreen…and eat less sugar? What??? That last one is not the easiest thing in the world. My sweet tooth is larger than my thighs. But if it can help me stay looking younger, I guess I can try to limit the sugar intake in my older age. But I’m not going to like it. The one thing that can derail my healthy eating in a hurry though is salted caramel. I’m trying my hardest to stay away from anything in the dessert family right now, but there is something about that combo of sweet and salty that I just can’t resist. Give me all the salted caramel brownie bites over wrinkles any day! A few months ago I found these salted caramel chips at the store. You better believe that I bought almost every bag on the shelf. Now every bag on the shelf translates into five if you are wondering. I ripped open one of the bags as soon as I got home and popped a handful in my mouth. Holy cow!!!! This is going to be dangerous for my healthy eating habits. Those little chips are out of this world good. They have the perfect blend of sweet and salty goodness in every morsel. I couldn’t stop reaching in the bag for more and more and more. I’m pretty sure I ate half the bag that day because every time I walked by I reached in for more. With four more bags in the pantry, I had to find things to make with them right away. 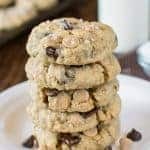 The first thing I made were a few batches of these salted caramel chocolate chip cookies for our cookie jar. That still left me with a few bags of those chips though. I tried hiding them in the back of the pantry, but I was still sneaking handfuls every once in a while. This was not helping me stay away from sugar or fight the old age. That’s when I decided to use some of the chips in a batch of fudge. 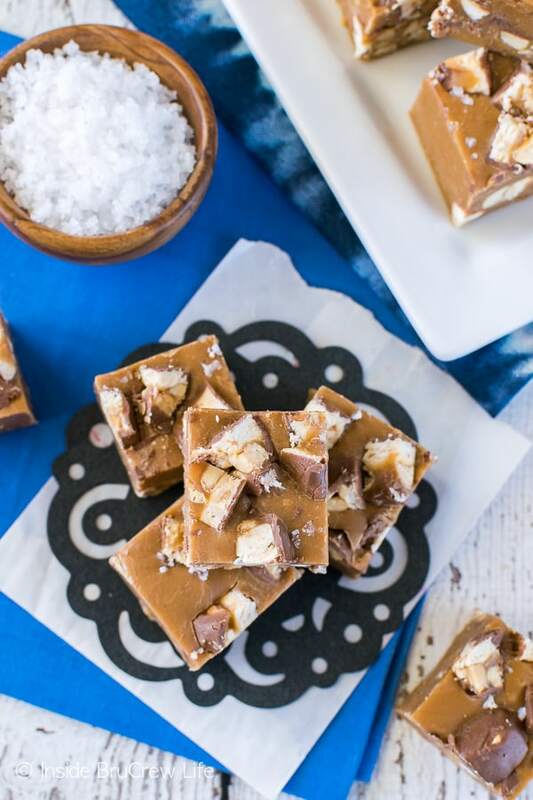 This caramel s’mores fudge was my inspiration for this new sweet and salty creation. Did you know you could make fudge by melting chocolate chips and a can of frosting together? Yup, super easy! 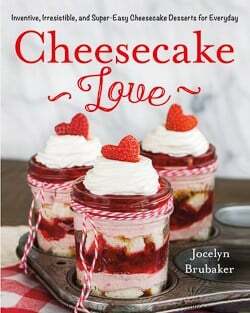 Melt it all down until it is creamy, fill it with whatever candy your heart desires, and pour it in a pan. 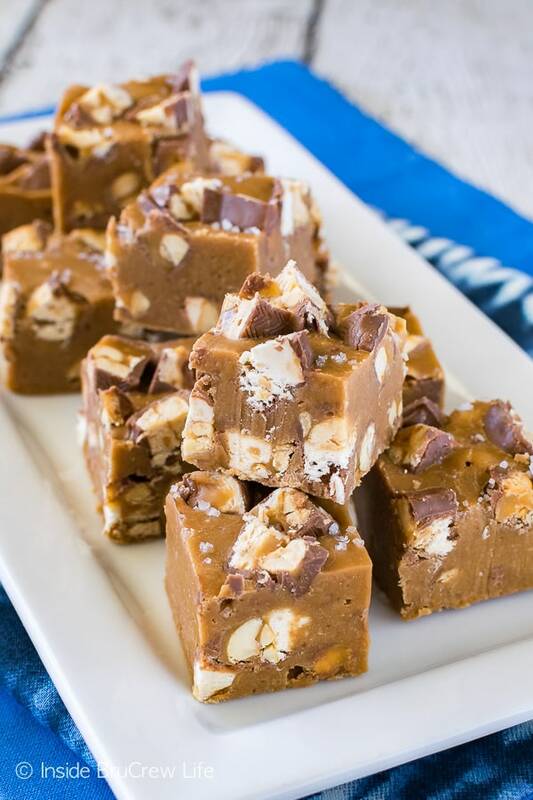 We had a bag of Snickers baking bites in the pantry, so I chopped those up and add them to the fudge because peanuts are salty too. So, I figured that candy would be perfect. 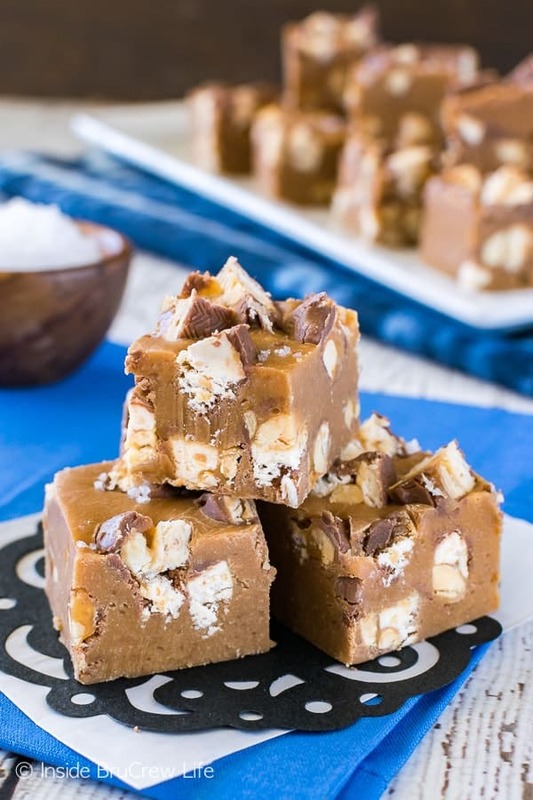 Now trust me when I say this salted caramel Snickers fudge is dangerous. I highly suggest sharing it with all your friends. Heck, share it with your enemies too. Whatever you do, just eat a few pieces and then get it out of the house. Your wrinkles will thank you later. 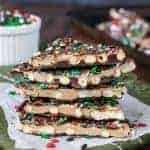 If you are still wanting more sweet and salty treats, I suggest checking out these Sweet and Salty No Bake Popcorn Cookies. They look like the perfect movie watching cookie. 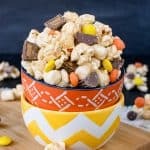 Of course, a batch of this Sweet N’ Salty Party Popcorn and this Sweet and Salty Caramel Snack Mix would also be perfect for munching on while catching up on your shows. 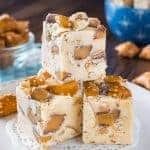 Place the salted caramel chips and butter in a bowl and microwave 1 minute. Remove the foil lid from the frosting and heat for 1 minute. Pour over the chips in the bowl and stir until thick and creamy. Microwave it for another 10-20 seconds, if needed. 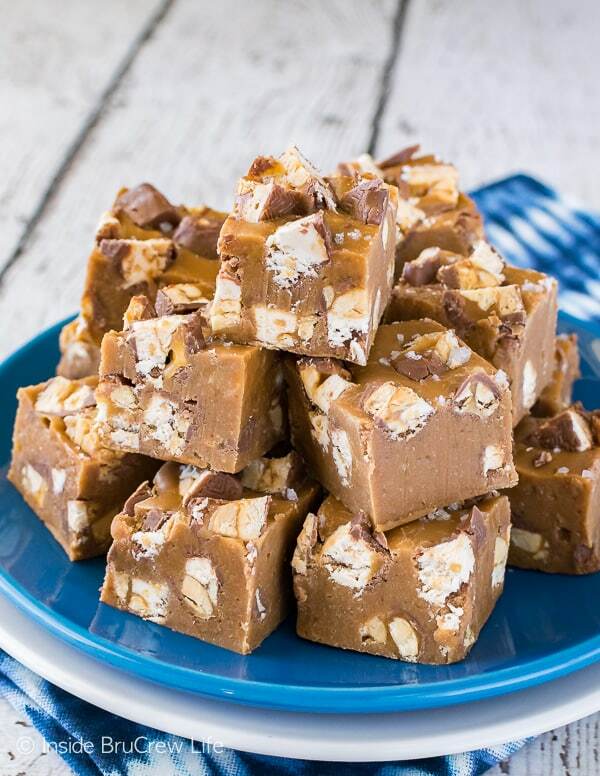 Let it cool for a few minutes, then stir in 1 cup of the chopped candy bars quickly. Pour into the prepared pan and spread out. Avoid stirring too much or the chocolate on the candy bars will melt. 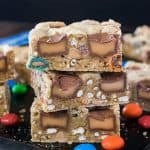 Press the remaining candy bars into the top of the fudge. Sprinkle with a little bit of sea salt and let set. Cut into 36 squares when it has hardened. *This post contains affiliate links. 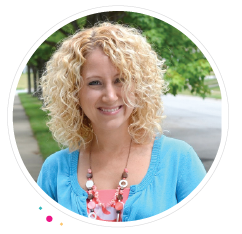 Inside BruCrew Life may receive a small percentage from sales made through these referral links. As always, these do not cost you any extra. Thank you for letting us share products we use and love this way. Oh my sweet mercy. This looks irresistible! 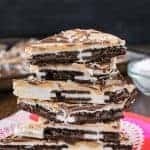 Snickers are my husband’s faves, so maybe I’ll make this for his birthday! I’ve seen a lot of beautiful things in my life. But this…like whoa. What are Carmel salted chips? I’ve never heard of these. Where do you purchase them? A few different chocolate companies have started selling caramel chips. You find them in the baking aisle with the chocolate chips. Thank you…I think the word ‘salted’ threw me off????. I’ve seen Carmel chips in that section of the store. I looked in a couple of stores, couldn’t find caramel frosting, used milk chocolate instead because well, snickers has milk chocolate so I figured it should be ok and I really wanted it. It’s good too!